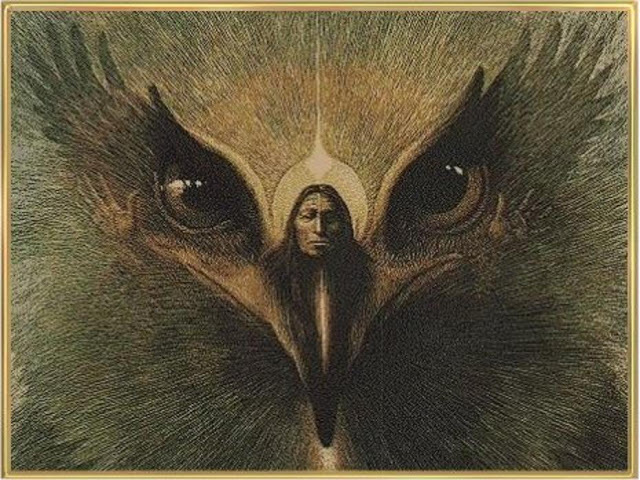 Before I found my feet on the contemporary shamans path I had what feels like another life. It was all about theatre, acting, performing, teaching etc. Between that life of theatre and the life of the shamans path I unraveled to a degree that I heard voices, felt incredibly ill, shaved my hair off, isolated to the point of deep depression and found myself looking deeply into the eye of madness. However underneath it all there was a message of guidance building but it was so deep in the subconscious I had no idea what was being called to be created. This is what came from the rite of passage of madness that I walked through. This was the path to recovery. After twenty years in experimental theatre and seven years researching and working with emotionally & spiritually disturbed people, I came to the realisation that insanity is only one option in becoming aware of the abilities we have as sensitive souls. I too have been lost and on the edge of insanity but fortunately saw the wisdom behind the crisis which has directed my soul to write this book. Everyone at one time or another has doubted his or her own sanity. That is not unusual. The difference is what we do when that happens. Some have been blessed by being able to push through and overcome it, some don’t. It’s heartbreaking to see a soul we dearly love dragged away into an ambulance and taken to a place where we feel they don’t belong. What other choices are there? I have heard so many people crying for another way. I would like to share with you what I believe is the truth of people who are living another reality. Throughout my research, counselling and personal involvement with ‘Acutely Sensitive’ people, I have found that the cause of schizophrenia seldom originates from a brain dysfunction. I believe they are deeply, spiritually wounded. As mother earth becomes more dramatic in her healing changes many souls are losing their grip. This book is a guide for people who are sensitive by nature, whether schizophrenic or simply too vulnerable and are finding it hard to cope. It is also a handy manual for carers and therapists to understand the world of the Acute Sensitive from a more holistic perspective. Medical doctors are wonderful in their art and should not be condemned, as they are masters of their craft. However, they are not doctors of the soul. Religion may benefit those who follow, although that may not be everyone’s chosen path. What I ask of the reader is to drop what you think you know about mental illness and see an empty canvas where new colours may be painted…. Then after the picture is finished, stand back and look at the whole painting. Not all artists suit all tastes, however, each painting tells a story, a view through the eyes of another which the observer may identify with…this may be one of those paintings for you. “Odette Nightsky has had the courage and sensitivity to present an alternative view of schizophrenia and of other psychotic illnesses. 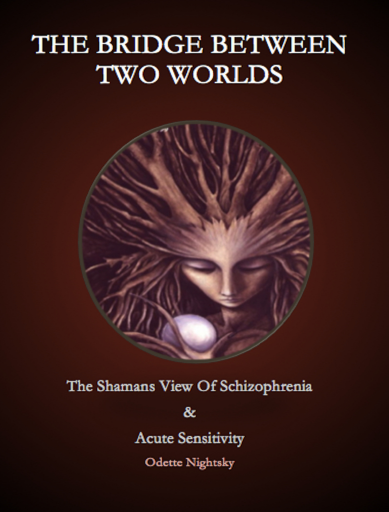 She believes that people with schizophrenia are deeply spiritually disturbed, and acutely sensitive to the world and the universe – around them. The healing pathway she suggests is one that helps people reclaim the ground of their being, and achieve harmony and balance within their lives. Illnesses like schizophrenia are mysterious – even for people like me who grew up wearing shoes of science and have since flown in all kinds of directions trying to understand what’s going on. What I like about Odette’s book, The Bridge Between Two Worlds, is that she isn’t proscriptive. She gently suggests how she sees psychotic experiences, and then allows the possibility of numbers of paths to healing, including the traditional ones of medication if that’s how people feel safest. Her approach is a responsible one”. Anne Deveson is a writer, broadcaster and documentary filmmaker with a long involvement in human rights issues. She has worked as a journalist for the BBC and the London bureau of the New York Times. is internationally recognised for her work in the media and mental health for which she was awarded an Officer of the Order of Australia. She has also received honorary doctorates by the University of New South Wales and the University of South Australia for services to the community. Writing this book sent me on the path that I still walk. I gave birth to something that was a huge catalyst in my own path to healing. As you will see at the latter chapters in the book I had been called to do this work through many lifetimes. It was an incredible gift in the midst of a powerful and challenging rite of passage. 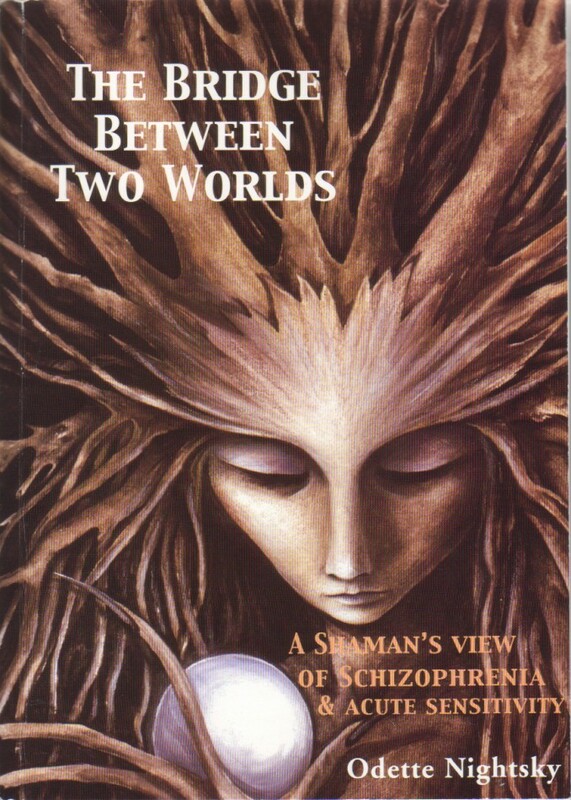 You can purchase The Bridge Between Two Worlds as an Ebook straight from my website.